Palatable game meat is either the ultimate goal or anticipated final end result of any hunter who takes the time to craft and refine their technique. Endless hours of preparation go in to the process of locating and harvesting a game animal, often to have little to no emphasis placed on how to insure the greatest result when the meat hits the table. This process is most evident in the pursuit of big game animals, where the time from kill to processing is much greater than that of small game animals that are more portable and easy to completely clean afield. Almost exclusively deer do not fit in your hunting coat’s game pouch, if they do you’re either in Africa or you really need to re-evaluate your hunting tract. Thus removal and handling require completely different methods and time frames to even have a close end result. Deer and any animal of the like or larger, are going to require special provisions and steps from the time the animal is taken to the time the meat is wrapped and ready to be frozen. There are often rituals of meat-pole display and lengthy photo shoots to document or display hunt results that hinder timely handling of meat, especially when it comes to big game animals, that directly affect palatability. It would never be recommended to take away the process of documenting something that brings so much enthusiasm and joy to hunters as their photo gallery, but perhaps reworking the process may allow for improved end results. By all means, take the time to pull out a camera and take valuable memory shots of the moment. Likely you will be happier in the long run when the pictures are actually in the environment that the animal was taken in, but that is another article all together. When an animal is harvested there are a few things that definitely need to happen and in some cases a few things that absolutely should not be over looked. Shifting your Focus, immediately after the kill, to ensuring better tasting and favorable meat will greatly improve your chances of greater palatability. When the following steps can be taken immediately or as soon as possible in your harvest sequence, your success at better tasting meat will be very evident, and the people who consume your spoils (no pun intended) may become more supportive of your sport. Timing is truly the critical element in this entire process. Think of the moment of kill as the starting of a stopwatch, in this case some of the steps will be measured in short time frames and some in much longer time frames. In reality, when an animal is killed and I will use a deer for this example, what you have lying in front of you is a pile of meat that is surrounded by a blanket of hide designed to keep the meat warm. Various levels of adrenaline and chemicals in the body have suspended themselves in the exact location they were in when the animal stopped moving. Those chemicals, many of them containing enzymes will change as the body cools and can affect the taste and quality of the meat. Within the next layer, internally, a system of organs that were always processing chemicals to help breakdown food and fight diseases are now becoming toxic influences to the meat the longer they are left to sit and leech. This is especially true if their containment has been breached when the animal was killed. Removing both of these influences that are working together to start to do mother natures business of degradation and self disposal will be the first step in making better soup. Even entry-level hunters know that removing the entrails of a deer is important. Care not to puncture the bladder or the stomach during the process is what everyone has been taught, next is to clean out the cavity as best you can, important in removing any excess blood or bodily fluids. Snow, when available, is a first and excellent choice for more than one reason. It is a natural and abrasive cleaning compound and it starts to cool the meat just because it’s snow. However, some geniuses like to move their animal to a stream and drag the animal around in the water to clean it out. This works well, providing you are not using stagnant or standing water or even worse, water infected with giardia or e-coli. To most hunters the natural sheath of protection, the hide, protects meat as it is dragged across rocks, dirt and corn stubble to the mode of transporting the animal to the butcher. A process that moves blood around that is still contained in the various arteries and veins of the body. Once the animal is then loaded for hauling and if you are lucky, the area that the blood begins to pool in the meat (which is a function of gravity and referred to as lividity), is not in or on your favorite cut of meat. This gathering of blood creates a dark blue to black area that looks almost like trauma to the meat. If left to coagulate in it’s location the affected meat will either become garbage scrap or hamburger depending on your meat processor. Hours later the animal is delivered, hide intact, to the processor who will within hours or days remove the hide and cut the meat. After removing all of the shot and tainted blood meat, your food will be wrapped and frozen. Bon appetite. This process has unbelievable opportunity for improvement as you can imagine. Just from some of the realities you may be experiencing from what you have read so far, it should be apparent that there is a direct correlation to proper meat handling and better tasting meat. In the West this process has been refined quite well. Not because the hunters are smarter or the weather is more favorable or anything like that, but because the animals that many people hunt in the west are much larger. When one is harvested you actually have two very distinct choices about your meat, cut it up and pack it out, or eat it there. Most folks cut it up and pack it out, thus inadvertently or by nature of the process, tend to experience better tasting meat in the end. Properly caring for your animal where it was harvested and taking certain steps immediately as opposed to following the above regimen will have an enormous effect on meat quality. If you doubt this concept, but are willing to take a few extra steps the next time you harvest a deer, try this process and determine for yourself if there is any validity to making a better tasting wild game entrée from the get go. 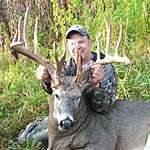 First get all of your pictures and record critical measurements of the animal if mounting the trophy is your objective. This is an entire other subject in itself and not going to be covered here, this article is about better meat. Once photos and recording are complete, remove the entrails as soon as possible. At this point I recommend a “down animal” pack that can contain some of the tools I am about to discuss. It is not only practical for supplying the tools, but as you will see has value in removing your meat later. Skinning tools and sharpening stones (especially useful if you have extra time in camp to cape your trophy for the taxidermist). Rope (if hunting elk or larger animals a pulley system). Mantee’s- (4) 4’x4’ (Canvas tarps used by outfitters to wrap clients gear for transport). Clean rags and a bottle of clean water. Once the entrails are removed, using the clean rag and some of the water, clean out the cavity as best you can. If snow is available, by all means take the advantage but keep frostbite in mind. Cut the jugular and hang the animal to bleed out as much as possible and for as long as time permits, (for mounting this process may need to be rearranged as cutting the throat through the hide will damage the mount quality). Use this time to collect your tools for the next task. Next open the tarp and place it beside the animal. Either skin or trophy skin the animal and move the carcass to the clean tarp. Bag the hide or remaining hide sections in a garbage bag if you were able to keep most of the blood off of the hide. This hide can have incredible value as an attractant or distraction for future hunting endeavors, again, another article. Section the animal into four quarters cutting through the spine minimally or not at all if it can be avoided. The spine is of concern if you are hunting in an area that CWD may be present. Again, wipe the meat as clean as possible and place each section into one of the porous game sacks. Once all four sections (or two if practical) are bagged, remove the backpack carriage from the external frame and attach one of the sections to the backpack frame with the rope. You will then be able to transport the meat attached to the frame, allowing air to circulate around the meat while packing out. This aids in the rapid cooling of the meat, an important factor in better quality and taste. An additional or remaining section can be carried by hand to where the animal will be transported. Once the meat is removed all remaining parts of the pack and the hide should be retrieved and the kill area cleaned up of all garbage generated from the process. There should be urgency in you at this point to get the meat to a location to hang and continue to bleed out. Once at the location where the meat can hang, remove anything the meat may have been transported in with the exception of the porous game sack and hang the meat where it can cool and have air passing around the entire section. The ideal temperature for this hanging area is between 38 and 40 degrees. If that temperature can be maintained, allowing the meat to hang for seven to ten days will allow the meat to begin breaking down from the enzymes and acids that are part of the deterioration process. If the temperature is maintained, this process will not hurt the meat at all and will soften muscle and ultimately tenderize the meat. The lack of blood contained in the meat will help enormously with palatability. Once the meat is aged and ready to be cut, ask your processor to make the cuts you want and wrap the meat without washing it. The reason for this is simple, you almost never see freezer-burned hamburger and that is because hamburger is never washed with water. Meat that is washed with water before freezing stands a higher likelihood of freezer-burn because the water absorbs and expands inside of the meat, crystallizing with the meat and ruining it. If you wash the meat just before cooking, you will have properly cleaned the meat for human consumption. Now this sounds like a great deal of work and frankly it is. However, this is exactly what hunters all over the West find themselves doing as a matter of required routine, and when was the last time you heard someone say they had a bad piece of elk meat? Coincidence?